Sid: Your cheap parlor tricks have no effect on me, mage. That’s right, unnamed mage. Sid is far too awesome to die by magic. OHOHOH! I know that from somewhere…Where do I know that from?! 🙂 Sid vs Mage. Who will win? The Shadow Knows! sadly, I do not. Newcomer here, and I like what I see so far! Plan to add this to the list of comics I follow regularly! oops, magic just tripped over the boot of reality. Duuh, is’nt it obvious? Sid’s a hightlevel magekiller, they get so much arcane resistence that they can piss of guards wearing brass armour standing in a puddle of water and walk away afterwarsds. I’m totally adding this to my webcomic list. Not that it isn’t already a mile long. But worth it!!! Ah, the magic resist was in you the whole time! Hm. 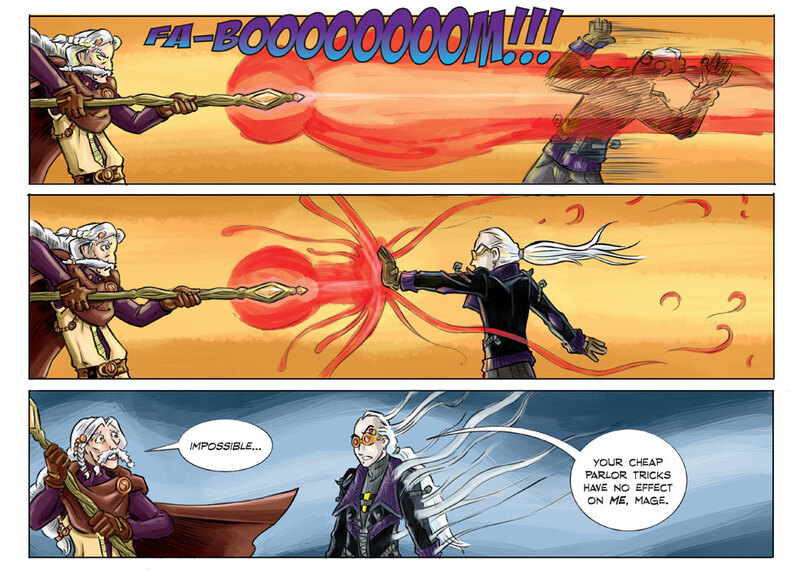 I just discovered this comic today, and must ask, is this antimagic ability a form of magic itself? If not, how exactly does it work in your universe? Im not trying to degrade it, I just want to know its mechanics, if there are any. Hello Jesse and welcome! There is a reason and I can’t tell you what it is yet. It will be explained.